Give back this season with jewellery from the stunning new Blue Ruby x Cause We Care 2018 Spring Collection. 100% of the proceeds from these beautiful bracelets go towards Cause We Care Foundation’s programs and initiatives in support of single mothers and their children in need in the Greater Vancouver area. Since the program’s inception in 2013, Blue Ruby has successfully donated over half a million dollars to Cause We Care’s initiatives. 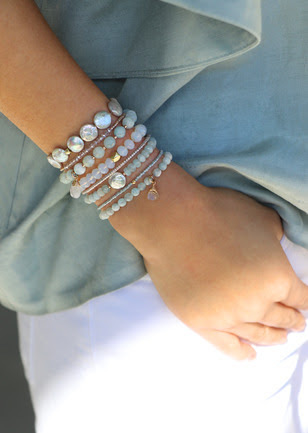 The 2018 Spring Cause We Care collection boasts aquamarines and moonstones paired with fresh water pearls. Soft muted tones are accented with luminous golden Japanese Miyuki beads that work harmoniously in delicate sophistication whether worn as a singular piece or stacked together for a more dramatic and individual style. Blue Ruby Jewellery is a longstanding partner and supporter of Cause We Care and continues to bolster the foundation’s many initiatives that include housing, after school care programs, day care and back to work training opportunities. Bracelets from the new Blue Ruby x Cause We Care collection retail from $20 to $125 and are available for purchase at all ten Blue Ruby locations, in addition to Hill’s of Kerrisdale, Hills Dry Goods Kitsilano and the newly opened Hill’s Dry Goods South Granville. For more information, contact ruby@blueruby.com.